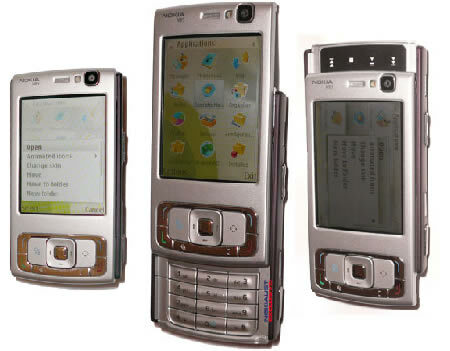 Nokialist was lucky enough to lay their hands on a pre-production unit of the much awaited Nokia N95. Those of you not aware of this super phone here is a quick recap the N95 is Nokia’s most advanced phone yet. It’s features include 5 Megapixel camera with Carl Zeiss optics, 150 MB internal memory, HSDPA, GPS, 2.6′ QVGA LCD supporting 16 million colors, dedicated music keys, ATI Gaming chip, Wi-Fi, Micro D card slot and EDGE. The phone will hit stores on Q1 2007 retailing for $ 700. Although we think there are some things that would make the N95 even better, such as the joystick, its current offering is really great. We are not going to ‘rate’ it based on this early beta unit, but if we were going to do that, we don’t think it would score anything less 95%. Justimagine how would the final product be rated. If some people still misunderstand Nokia’s concept of ‘multimedia computers’, I believe this device is Nokia’s definite reply. This phone is amazing! 5mp camera, GPS maps…I can’t wait for it to launch. I wish I knew the CPU speed though….